But where has all the money actually gone? Towards developing and implementing water purification and sanitation systems? Or basic nutritional support aimed at optimizing immune function? How about providing shelter and medical facilities for the homeless? Not even close. It is quite possible that any dissenting voice not in support of universal vaccination campaigns may be included in this type of "surveillance and alert system" as a potentially endangering the lives of others, i.e. "killing children." What is so ironic about the situation is that the Gates Foundation-supported Polio Global Eradication Initiative may have resulted in over 47,500 cases of vaccine-induced paralysis in Indian children in 2011 alone, and which is twice as deadly as the wild-type polio it claimed to have put an end to officially on Jan. 11 2012. Who here then, is truly concerned about the health of children? Moreover, it is exceedingly difficult to view Bill & Melinda Gates foundation's GCGH as a strictly humanitarian foundation considering many of the projects it chooses to fund. Here are a few listed on their website which have already received funding. Synthetic Lymph Nodes: Steven Meshnick and Carla Hand of the University of North Carolina in the U.S. will develop a bio-compatible, biodegradable polymer device that can be placed under the skin to introduce vaccines and antigens to the immune system. The device will attract immune cells and trigger their proliferation as well asact as an adjuvant at the site of injection. 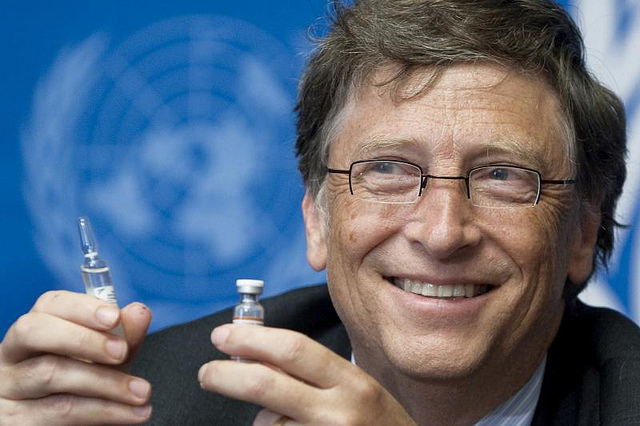 If successful, the device could help boost immune response to new and existing vaccines. [see our article on transhumanistic technologies]. Needle Free Vaccination Via Nanoparticle Aerosols: Vaccine delivery systems that target specific areas of the body have the potential to be especially effective against some types of infection. For example, inhaled vaccines may better guard against respiratory diseases, such as tuberculosis, and those that commonly infect the tissues of the nose and throat, such as diphtheria. Dr. Edwards is leading a multidisciplinary team using materials science technologies combined with infectious disease, device, and toxicology expertise to reformulate tuberculosis and diphtheria vaccines into aerosol sprays that can be inhaled. The team's ultimate objective is to develop a cell-based BCG vaccine for tuberculosis and a protein antigen CRM 197 vaccine for diphtheria in the form of novel porous nanoparticle aggregate (PNAP) aerosols. Plant-Produced Synthetic RNA Vaccines: Alison McCormick of Touro University, California in the U.S. will test the ability of a low-cost plant-based synthetic biology method to produce a combined viral protein epitope with an antigen RNA expression system for use in an RNA malaria vaccine. Using plants for this viral transfection system could make RNA vaccine production scalable and cost effective. Profitable Vaccine Distribution In Emerging Markets: Lisa Ganley-Leal and Pauline Mwinzi of Epsilon Therapeutics, Inc. in the U.S. will test the hypothesis that selling vaccines through medicine shops in emerging markets can lead to profits for both vaccine developers and the small business owners. Demonstrating profitability may lead pharmaceutical companies to invest greater resources in vaccine development and distribution and develop local partnerships for profitability strategies. Genetically Programmed Pathogen Sense and Destroy: Saurabh Gupta and Ron Weiss of Massachusetts Institute of Technology in the U.S. proposed creating sentinel cells that can detect the presence of a pathogen, report its identity with a biological signal, and secrete molecules to destroy it. This project's Phase I research demonstrated that commensal bacteria can be engineered to detect and specifically kill the model bacterial pathogen Pseudomonas aeruginosa. In Phase II, Gupta and Weiss will engineer the human microbiota to specifically detect and destroy the gut pathogen Shigella flexneri, which is responsible for high mortality rates in children. Vaccine in a Salt Shaker: A New, Safe, Low-Cost Approach: Shiladitya DasSarma will lead a team at the University of Maryland, Baltimore in the U.S. to develop an inexpensive, safe, and effective oral vaccine against invasive Salmonella disease using gas-filled bacterial vesicles. The project seeks to produce a salt-encased, shelf-stable vaccine requiring no refrigeration for distribution worldwide. A Humanized Mouse Model to Evaluate Live Attenuated Vaccine Candidates: To develop new vaccines against some of the world's biggest killers, including HIV, malaria, and tuberculosis, scientists must be able to evaluate promising candidates. Some of the most promising potential vaccines, are made from weakened live versions of the infectious agent. As a result, they cannot be studied in human trials unless researchers can be confident that the weakened vaccines will be safe. Dr. Flavell and his colleagues are working to genetically engineer laboratory mice whose immune systems are similar enough to humans to permit testing of vaccines against diseases that disproportionately affect people in the developing world. Alternative Delivery of Human Milk Proteins to Infants: Qiang Chen of Arizona State University in the U.S. proposes to engineer edible plants, such as lettuce and rice, to express beneficial proteins found in human milk. The protein bodies in these plants allow for the stable, high accumulation of these human milk proteins, and the plants can either be eaten directly by infants or formulated into baby food to provide essential nutrients and antibacterial benefits. Non-Hormonal Female Contraceptive Targeting Egg-Specific Metalloprotease:John Herr of the University of Virginia in the U.S. will research the egg-specific membrane enzyme metalloprotease as a target for a non-hormonal female contraceptive. After determining the nature of the enzyme's catalytic pocket, a family of peptidomimetic compounds will be tested for their ability to bind to the enzyme and block its key role in egg fertilization. Bacillus-Fermented Natto as Edible Vaccines for the Developing World: Michael Chan of the Ohio State Research Foundation in the U.S. will develop an engineered strain of bacteria used to ferment beans in traditional Asian and African diets, to display an antigen from the Tuberculosis bacterium. The engineered bacillus will then be used to make the traditional Asian dish natto, which can serve as a kind of oral vaccine to elicit a strong immune response. If successful, this strategy can be used to introduce a variety of disease antigens through culturally accepted foods. Nanotechnology-Based Contraception: David Clapham of Children's Hospital Boston in the U.S. will develop and test a nanoparticle contraceptive that releases sperm tail inhibitors in response to vaginal pH changes or exposure to prostatic fluid. If successful, the nanoparticles could be incorporated into a vaginal gel to block sperm motility required for fertilization. Circumcision tool For Traditional Ceremonies In Africa: Kathleen Sienko of the University of Michigan in the U.S. has developed a prototype circumcision tool for use in traditional ceremonies in Africa, and seeks to demonstrate the functionality, cultural suitability, and potential for low-cost mass production of the device. Such a tool could increase the circumcision rates leading to lower rates of HIV transmission in the region. Discovery of Chemosensory Molecules as Novel Contraceptives: John Ngai and Scott Laughlin of the University of California, Berkeley in the U.S. seek to identify chemical compounds in the female reproductive system that guide sperm cells to the egg. By characterizing these "odorants," synthetic versions can be produced and administered to disrupt this navigation system thus inhibiting fertilization. Transgenic Cow Milk Containing Human Antimicrobial Protein: Hironori Matsushima of the University of Toledo in the U.S. will test the hypothesis that adding an antimicrobial peptide to powdered milk products can confer protection against enteric diseases. Research will focus on testing the peptide for its ability to kill pathogens in stomach conditions, and on its ability to maintain integrity through the milk pasteurization and drying processes. Ultrasound as a Long-Term, Reversible Male Contraceptive: James Tsuruta and Paul Dayton of the University of North Carolina, Chapel Hill will study the ability of therapeutic ultrasound to deplete testicular sperm counts. Characterizing the most beneficial timing and dosage could lead to the development of a low-cost, non-hormonal and reversible method of contraception for men. You will notice from the examples listed above that all of these funded projects involve the development of proprietary (read: potentially profitable) and as-of-yet unproven technologies, and which will require the transformation and/or alteration of a natural process or substance. Also, many of the grant disbursements have gone towards contraception. This appears to diverge from the GCGH's mission statement of "improving health in the developing world," insofar as it is focused onreducing population in the developed world, rather than supporting the health of those alreadyliving, in need of help.